As someone who can do a lot of my travel by foot or on public transport, I drive fewer kilometres than the average. But sometimes I have to drive. I was thinking about the things one can do to be a considerate driver with regard to more vulnerable road users such as pedestrians, cyclists, motorcyclists, and also specifically with sustainable modes such as pedestrians, cyclists and public transport. Of course the first thing is simply observing the law: for instance giving way where required — when turning into streets (except roundabouts), turning in or out of private premises including car parks. Stopping at the stop line (or equivalent spot), not beyond it, obviously. And avoiding entering intersections where the exit isn’t clear — common in the CBD, resulting in blocked pedestrian crossings. Always indicating, of course, whether I can see people or not — as my driving instructor noted, it’s when you don’t notice someone nearby that it’s particularly important. Giving way to buses pulling out from the kerb is not only mandated by law, it also gives me a warm inner glow. Of course, don’t park on footpaths. But beyond what the law requires… what can one do to facilitate others, particularly those using more sustainable travel modes? What can I do that not only keeps those people safe, it also makes their trip more pleasant, such that they are encouraged to keep doing it? I tend to give way to pedestrians when I’m coming out of streets, even though this is not required by law. When giving way or stopping for others, I don’t zoom up to the stop line then screech to a halt like I’m in a car chase. Coming to a stop slowly and acknowledging others with a nod if they look my way seems to me to be a way of giving them assurance that I’ve seen them and am willingly waiting for them. And I’ll give them plenty of space and time to cross, and not zoom past once they’re done. Some motorists do this really badly, their driving style telling us they are only giving way grudgingly, and some appear to almost try to intimidate others to relinquish their right to go first. I try to avoid having to wait to turn right, blocking trams. In fact I mostly tend to stick to non-tram roads when driving. There are plenty of them, and it helps us both. Staying at least a metre from cyclists isn’t yet law in Victoria, but is a good practice anyway. Acknowledging someone for letting you through, and giving way, is a simple courtesy that seems to be rarely afforded here. It isn’t hard to wave or nod! And don’t get me started on drivers sitting on the speed limit in the middle or inside lanes of the freeways..! I will generally give and get a wave when giving way on narrow roads. But this is not a blog post about general driving etiquette, so let’s try and stick to the topic here: interacting with pedestrians, cyclists, PT. I generally try and leave some big gaps queuing in the left lane if a tram will soon pull up alongside, so there’s plenty of space for people to exit. Often trams pull up next to a line of cars stopped at the lights all very close together, with consequent difficulties for people boarding/alighting from the tram (especially if they’ve got a shopping cart/wheelchair etc) . I think one of the most important things to consider is how to make your behaviour predictable, like your example of not racing to the stop line so that it doesn’t look like you’re about to drive through. While I generally agree with what you’ve written, I think the idea of giving way when coming out of streets works against this. When I’m out walking or running or cycling I’d rather drivers just behave predictably. I dislike the situation where I wait and the driver waits without being required to, then if I don’t react immediately we both go, then both hesitate and on it goes. I spent years commuting by bike (without accident) so I am probably a bit more attuned to being considerate to and aware of cyclists when driving. Something in particular which I see drivers not doing well is estimating the speed of a cyclist, then overtaking before immediately turning left across their path. Just accept that you’ll need to slow down for 5-10 seconds and slow down to the cyclist’s pace and even fall in behind them so it’s clear what you’re doing. And also be aware that if the traffic’s heavy it’s quite possibly that a cyclist could be overtaking in the pitifully narrow lane to the left of your car so look before you turn into a driveway or street. Making sure you don’t door a cyclist is your obligation when opening a car door, but it must become habit to look every time. Along the lines of not turning right if it’s likely to hold up trams/buses/other traffic I avoid trying to do get into a tight parking space if I would hold people up doing so. I give way to pedestrians if they want to cross, especially in places like Centre Road where there’s pedestrians crossing through the shopping strip. And to make sure they know I’ve seen them, I gesture to them with a hand wave to cross in front of me. Same if I stop at a zebra crossing; I make sure I gesture to the peds and make eye contact to reassure them I’ve seen them and will wait for them to complete their crossing before I put my foot to the pedal (gently of course) in the 2-tonne metal-on-wheels machine that I drive. When it comes to buses, I give them way if they’re indicating right or when turning, but even as a long time PT user (I’m still a dual-mode user), I find a number of bus drivers to be pretty poor road-sharers. I’ve had a few honk at me even though I’m almost past their vehicles even before they start indicating to leave their stop. I understand I have to give way to them if they’re indicating right, but don’t try to use the size of the vehicle to brow-beat me into giving way when you’re stopped and have the hazards on(!). I also tend to stay either well clear in front of them or behind them, because their turning circles make clinging to their side an invitation for them to clip my mirrors or worse. Even when a bus is to the left of me waiting to turn right/left into another road, I don’t commence my turn until the bus goes through first and I can see exactly how much of my lane it will impinge on. Once on the straight run after the turn, I overtake them as per normal safe practices. Cyclists, it really depends…out here in my suburb, there aren’t that many cyclists to contend with (and admittedly, I get a but unsettled in cyclist-heavy suburbs at times)…but I treat them like any other road user. If they use hand signals, that makes life a lot easier. If I dont have enough space to overtake without a 1m gap, I’ll follow them like any other vehicle with a safe gap. 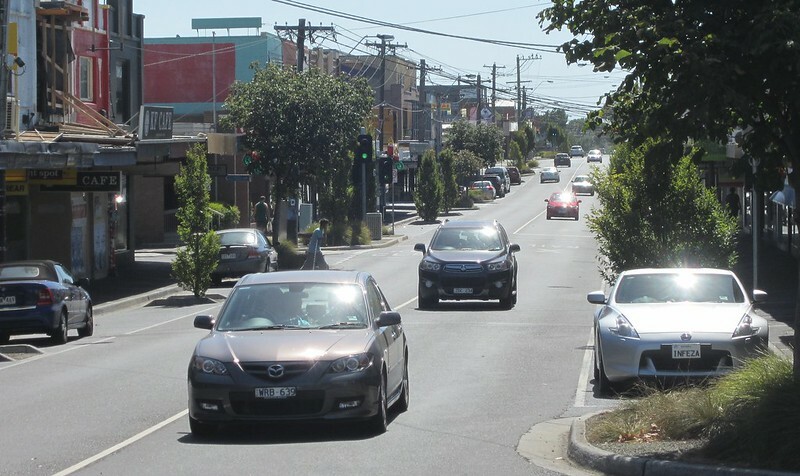 @Malcolm, this Vicroads web site has a good summary of the road rules, with a page about roundabouts: Vehicles do not need to give way to pedestrians at roundabouts unless there is a pedestrian crossing there. There is also a page about giving way to pedestrians. One of the interesting implications from the rule that: When turning at any intersection (except at a roundabout), you must give way to any pedestrians crossing the road you are entering is that a motorist turning from a side street into a main road should technically give way to a pedestrian crossing that main road. I’m not sure I’d trust any motorist to know that particular rule. I always give them room to complete their manoeuvres and then overtake them when safe, but they need to also obey the “give way to the right” rule when driving along on a multi-lane road, and not just plough into left turns assuming the car drivers will stop and give way because they’re second-best when it comes to mass/inertia of the vehicle. Bus lanes fortunately go a long way towards alleviating that (though the bus lanes along Wellington Rd are only exclusive to buses in certain times, otherwise cars can use them as well). That said, the number of idiots on the road who don’t understand that a turning bus needs multiple lanes is astounding. Thanks for your comment about not racing up to the end of a street where you must stop/give way. As a cyclist it scares me no end when I pass a side street and I don’t know if a driver is going to stop or not. As you mention, leaving a large gap to cyclists is good practice. But making it the law? It would just be another law that would result in confusion, would often be broken and be difficult or impractical to enforce in most circumstances.